Healthcare is a complex and often frustrating matter, especially for the person receiving it. Even those with excellent employer-funded insurance can suffer financially after surgery or an emergency procedure. Someone may think they’re covered, but bills can quickly pile up. Karin (last name withheld for privacy) felt the same way after her husband, Jeff, suffered a massive stroke. Her healthy, athletic husband suddenly found himself at Hoag Hospital clinging to life. He survived, but is faced with limited abilities and a very long recovery. And then came the bills. That’s where Corona del Mar resident Ferial Maghami comes in. She met with Karin at the hospital and became her private patient advocate. 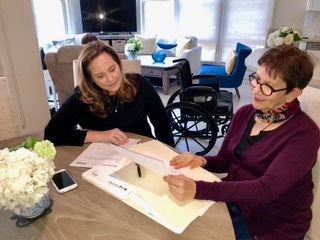 Private Patient Advocate Ferial Maghami (right) of Corona del Mar works with Karin on her husband Jeff’s medical bills. “The family was overwhelmed and confused about his benefits, and what they needed to do,” Maghami explained. “I cleared his medical benefits, out of pocket cost, helped the family to budget and plan. I filed for short and long-term disability, and [currently] in the process of working with the employer to increase the limit on his long term disability,” she added. She is also helping them to identify in-home services. Situations like Karin and Jeff’s are what inspired Maghami to go into patient advocacy. Her background gives an ideal perspective to help patients: She’s a Registered Nurse, a Certified Case Manager, and worked for multiple major health insurance companies at the executive level for 30 years. She’s using her experience and the skills she acquired over the years to help those who need it. Private patient advocacy is a relatively new profession, there are only around 400 of them nationwide. The Patient Advocate Certification Board recently developed an exam to certify those interested in the industry. Maghami was one of the first to take the test and be certified under the program. As demand and awareness of their services grows, those who are “lost in our health care system” can save money and find the right care, she explained. Fees for her services vary. Hiring a private advocate is like hiring a lawyer or an accountant, only she manages your medical bills, finds the right care from the right provider in the right location, while being the point of contact for all of them. Maghami, who started her business in October 2016, said she helped her clients save nearly $250,000 in 2017 alone. “It is both about saving money and helping them bring quality to their lives at a time when they are so confused and overwhelmed,” she said. Because each client requires a lot of time and attention, she only takes on five to six clients at a time. “I want to personally be available to my clients and attend to them rather than having hired help to do it. I offer and provide personalized service, and I believe that I must give my undivided attention to each client, do thorough and quality work, follow up, and communicate. It may sound cliché, but I genuinely mean that. For me, adding value to the client and supporting their needs are major priorities,” she said. It’s a lot of work, but Maghami feels passionately about helping those fraught with medical bills. “Helping families to manage and transition to the right level of care and finding them the right provider is a routine part of what I do. I know how to navigate the system, understand quality scores and rating, and can find the right care with the right provider,” she said. For more information, contact Ferial Maghami at (949) 246-6098 or visit managehealthinsurance.com.